Everything you describe constitutes a normal reaction after dermarolling and it will go away. The intensity of reactions after dermarolling is individual. Using the same size tool on the same area, someone barely gets red and the other is red for days. It also depends where you roll. Certain parts are more sensitive. What you describe is very common and a totally normal reaction. If you have no scabs but just skin flakes and the skin under the flakes is not "raw", you can rub them off. Wipe the blood off with a cotton pad with tap water. Reaching the capillaries means you have reached the dermis part of the skin but a 0.5 mm reaches just the top of the dermis and the scars may be deeper in the dermis. Acne scars usually need at least 1 mm dermastamp but if they are shallow, a 0.5 mm will also work. Continue with your dermastamp and when it gets blunt, you can go for 1 mm size. Congratulations to mother-to-be and good luck to you! Shingles are caused by reactivation of the chickenpox virus. Your choice of a 1.5 mm dermastamp is very good. Buy the one with 35 needles and stamp the scars densely every three weeks. If you get no improvement after six months of stamping, add the suction pump because some of these type of scars may be tethered. There is no problem with waiting for several more weeks. If the scars are fresh, they will likely still improve a little by themselves. Also, if you had the shingles very recently, it is wiser to wait anyway to be sure, that the infection is completely gone before you start stamping. If you later submit "after" photos, that would be great. Thank you! Sorry for the delayed answer. I somehow overlooked this question. Since we started to sell dermarollers many years ago, I have heard about dermaneedling (rarely) causing long term hyperpigmentation, I have heard about cases when microneedling helped and also did not help with hypopigmentation, but I have never heard about dermaneedling causing hyperpigmentation. Can you please tell me some details about your dermarolling regime? Is it possible for you to post a photo of your mouth? Chemical peels are also more prone to such unwanted side effects because they remove layers of skin. Dermarolling does not. Typically, burns leave hypopigmented scars. If an injury is serious enough to leave a scar (which is not the case in dermaneedling), the scar is often hypopigmented because scar tissue does not contain normally functioning melanocytes to produce skin pigment melanin. Long lasting inflammation (chronic inflammation), such as for example in acne can also result in hypopigmentation but the inflammation after dermarolling is very short lasting and certainly not chronic. It lasts about as long as inflammation after sunburn. If you can show me a photo, it would be very helpful. Dermarolling / Microneedling / Re: Can often-used 2 mm needles cause permanent damage to facial skin? Renin, thank you for posting your experience. Using a 2 mm size, 3-4 times over a 4-5 month period is very reasonable frequency. 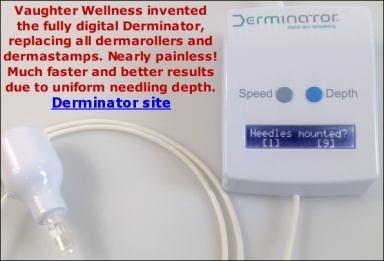 Many of our customers use a 2 mm size dermaroller or a 2 mm dermastamp or a 2 mm single needle without any problems. I do not recommend using a 2 mm dermaroller on the face for beginners, for those with thin skin or for those that do not really need such length. It is better to start with shorter needles. Did you manage to improve your scars? Dermarolling / Microneedling / Re: Infadolan then dermarolling, is it okay? You'll make the roller head and needles greasy but if you use a warm dishwashing liquid solution to thoroughly wash the roller head with and then thoroughly rinse it, that should be no problem. Please note that we do not know the effect of bringing the oily component of Infadolan perhaps deeper into the skin by rolling over it with long needles than it would normally penetrate (if at all) if you'd merely apply it over freshly rolled skin. Dermarolling / Microneedling / Re: Is there a way to get rid of moles at home? I searched for the product and it's incredibly over-priced and massively spammed-for so this was an exception - we do not allow mention of any such products in the future. This forum is only to support our own products, not to provide a platform to market other products. It would be much better to identify the active ingredient (it's some kind of acid that can easily cause permanent scarring) and find out where to buy a floz. for a few bucks. Dermarolling / Microneedling / Re: Which products to avoid with dermaneedling? Vit. E does have an anti-inflammatory effect but I am not sure how strong. The best is to roll the skin, apply vit. E on half of the rolled area and see whether there is significant difference in the length and intensity of inflammation in those two parts (compare redness, pain, increased temperature of the skin, swelling). No, our single needles are not suitable for classical subcision but needling will also loosen the fibrotic tethering (if there is one in place). You can needle the scar from different angles but you cannot use our needle horizontally under the scar and move it left and right to cut the fibers (which is subcision). Our needle is too short for this technique and it has no "knive". I do not recommend doing real subcision at home. It is quite risky, as it can leave scars. The reason we delete anything that competes with our products is because this is not a general dermarolling forum. This is a support forum for our products, intended to lessen our email support load. So it's intended as a business tool to support our customers, not as a general dermaneedling community. Sorry for being strict in that way. We really try to keep this a support forum only, otherwise things will escalate into a spamfest in no time. Sometimes, postings are on the edge and are permitted, but in principle this forum is just to help our customers with our products and nothing else. >Do I randomly stamp or is it a meticulous process where you go over the cheeks very finley with the stamp? Stamp just the scars (randomly) of one cheek (this can take an hour). Then roll the entire cheek. When it heals, treat the other cheek. During your first session, concentrate just on your worst scars. >I do have redness in the scars on my my cheeks. Will stamping bring my skin back to a more normal color? It usually does bring skin back to its normal color or at least partially. Nevertheless, the scars will be red for up to 72 hours after stamping. Do a test patch first to see how your skin reacts. If you have weekends off, stamp on Friday evening. >Will the zinc cause any problems with skin healing? >Is it safe to stamp the face then roll immedly after? >Finally, I am just wondering if using a 1mm stamp & roller on my forehead will it be enough to take care of small scars and lines on my forehead? A 1 mm dermastamp is not suitable for really deep scars but it is suitable for shallow to moderately deep scars. Not using anti-inflammatory substances applies only to substances with a STRONG anti-inflammatory effect, applied immediately after dermarolling (especially after dermarolling with long needles). Some hours later, it is already OK to apply them. Lots of substances have a very mild anti-inflammatory effect (for example certain oils) but that is not a problem. Avoid creams with corticosteroids, all non-steroidal anti-inflammatory creams, creams indicated to relief itchiness and irritation, creams for allergies, creams with a high percentage of aloe vera, avoid Tea Tree oil. Dermarolling will not help and should not be used because angular cheilitis is either caused by a fungal or bacterial infection or it is due to chronic inflammation. You should address the cause. If the cause was addressed and there is really just post-inflammation, dermaneedling is not suitable either. You can try a non steroidal anti-inflammatory such as Nurofen rapid capsules (it contains ibuprofen). Prick the capsule and apply some of it regularly on the redness (or mix it into a little cream). It will sting and it will make it temporarily more red but eventually it should suppress inflammation. First try it on one side only because this kind of inflammation often behaves in unpredictable ways. Dermarolling / Microneedling / Re: why my strech mark is not going away by dermaroller? Are your stretch marks red or white? Raised or indented? Two months is waaay too short! You have to be patient and continue for at least one year. I think the most effective for melasma is old good Hydroquinone. Buy a 0.5 mm dermastamp. Stamp your spots four times a week and apply hydroquinone right afterwards. Do it for three months and then one month off. I am not sure where I mentioned using acids after dermarolling but you have to be careful because any form of dermaneedling highly enhances the absorption of the applied products and you could end up with burns. You must do a test patch first. Some of our customers apply Retinoic acid (Tretinoin cream) on pigmentations right after dermarolling or stamping but not everybody's skin can handle it.